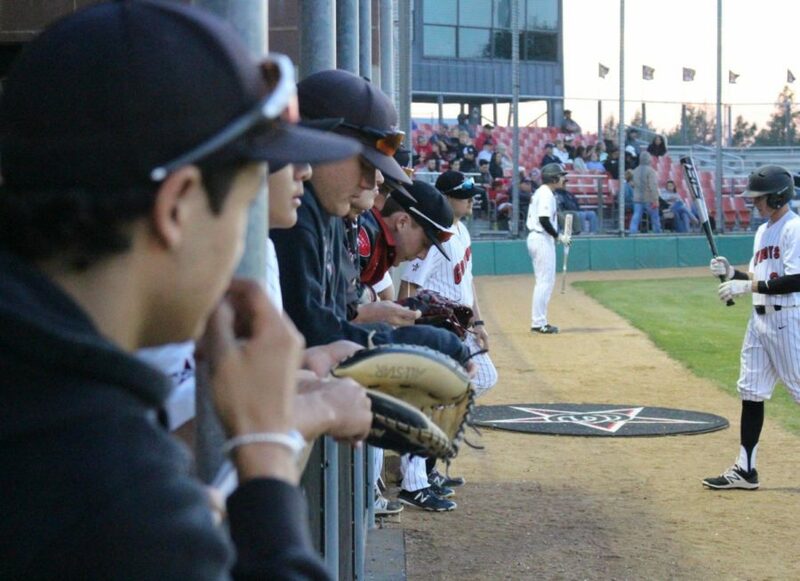 The Coppell High School varsity baseball team lines up in the dugout to watch the first inning of Friday nights game against the Skyline Raiders. Coppell pulled out a 12-2 win over Skyline at Cowboy Field. Prior to Friday night’s baseball game, which ended with the Cowboys run ruling Skyline 12-2, the fans in the stands and players in the dugout took the opportunity to appreciate the senior players and their commitment to the team. Senior players were lined up across the diamond, escorted by parents and siblings, to be honored by their fellow players, neighbors and alumni. These players were recognized for the manner they represented their town on and off the diamond during their high school careers. The announcer in the press box reminded the players of how they were, are and always will truly be Cowboys. 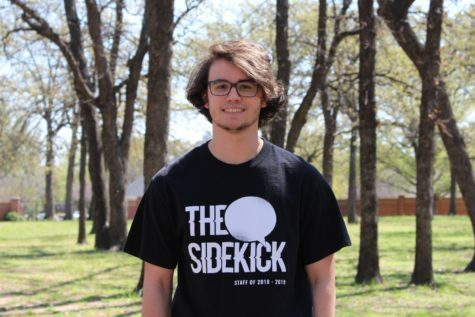 Senior ace pitcher Rye Gunter started on the hill for Coppell and immediately shut the Raiders down by striking out two, after the leadoff batter grounded out to second. In the bottom of the first, junior centerfielder Blake Jackson got the Cowboys going with a single to right field. Third in the order, sophomore catcher Hudson Polk singled to deep left and put Jackson in scoring position. Jackson scored on a sacrifice fly hit by junior first baseman Nick Vernars. Polk advanced and later scored on a passed ball. In the top of the second, Vernars fielded a hard hit grounder at the border of the dirt and quickly flipped it to Gunter at the bag, recording the first out. Gunter struck out the next batter and the final hitter grounded to second base. The bulk of Coppell’s runs were scored during the second inning. Senior shortstop Adrian Minjares led off and was hit by pitch. Next up, senior designated hitter Reid Valentine singled to left field, bringing up junior right fielder Dylan Nichols, who hit a single to left center. Due to an error, Valentine and Minjares both scored. Junior second baseman Josh Bartolacci advanced to second due to a bad throw on a routine grounder to third that scored Nichols. Senior left fielder Anthony Villalobos knocked in Bartolacci on an infield single and Jackson hit a triple to deep center field, which scored Villalobos. Polk, hit his second single of the night to left field and brought Jackson home. The inning put the Cowboys 10 runs ahead of their opponents. When asked what kind of message he would like to deliver to his senior players, Clark would advise his players to simply enjoy the game. The Cowboys are next scheduled to play the Richardson Eagles at home tonight at home, at 7:30 p.m.